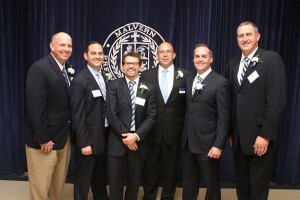 On the eve of Malvern Prep’s Homecoming, Malvern Prep honored six distinguished alumni for their accomplishments and service to both the Malvern community and the world. The Alumni Awards dinner has become a cherished tradition at Malvern, and on October 23, the Friar community gathered to celebrate St. Augustine Award winner Dr. Dan Kelly ’99, Alumni Loyalty Award winner Dave Frank ’91 T, and Athletic Hall of Fame inductees Dave Hisler ’95, Frank Oschell ’92, Kevin Pellegrini ’90 and Jim Rullo ’89. 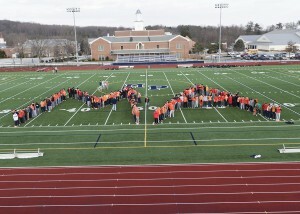 Oschell noted that his classmates and teammates made Malvern a special place, and that they continue to be a part of his life. “This brotherhood is how we accomplish great things,” he said. Kelly, the St. Augustine Award winner, has been a transformative force for the people of Sierra Leone as a doctor and tireless public health advocate. The St. Augustine Alumni Award is the highest honor that can be bestowed upon a Malvern alumnus, and it awarded in recognition of a lifetime achievements that exemplify the spirit of Malvern Prep and the core values of the Augustinian tradition. During Dan’s time as a student he participated in varsity soccer, mock trial and was a member of the yearbook staff. Dan was also a leader academically and graduated with the highest four-year G.P.A in his class He was also a member of the National Honor Society. Dan is the Founder and Chief Strategic Officer of Wellbody Alliance. Dr. Kelly founded Wellbody Alliance in 2006 and has worked closely with UNICEF and St. John of God Catholic Hospital. After two years of moving throughout the country in Sierra Leone, Dan transformed Wellbody Alliance into a stationary, primary care provider for the Kono District – the epicenter of Sierra Leone’s civil war and one of the poorest regions in West Africa. At the time Dr. Kelly settled in Kono, only four doctors were servicing a population of 400,000 people. Wellbody Alliance was originally founded to serve amputees and civilians wounded during the war, but within two years the organization was servicing the entire population of Kono District and providing healthcare to up to 20,000 patients a year. Currently, the Wellbody clinic provides radiology, HIV testing, primary care, diagnosis and treatment of tropical diseases, chronic illnesses and acute conditions. It is the only facility to offer ultrasound, electrocardiogram and oxygen services in the Kono District. Wellbody also manages a corps of community health workers who link communities to clinics in the most remote regions of Africa. The health workers provide psychosocial support, education and first-line care to HIV patients, pregnant women and children. This network has created a referral system that tracks patients from diagnosis to their treatment. In September of 2014, Dr. Kelly suspended his fellowship in infectious disease at the University of California-San Francisco to return to Sierra Leone to help with the Ebola crisis. Dr. Kelly has since been on the frontline of the Ebola battle. Dan currently resides in San Francisco, Calif., to continue his fellowship at UC-San Francisco. During his time as a student Dave participated in varsity football and track and oversaw the intramural program and the business club. Dave became an active volunteer for the Malvern Prep Alumni Association directly after graduating in 1991. He has been the lead organizer for class reunions, holiday receptions and the sharing of school news and initiatives. Dave has been a class agent and volunteer fundraiser for The Malvern Fund since the mid-90s and has been actively involved in connecting with current students for career guidance and mentoring by participating in Career Day, the Football Mentorship Program, and the Sophomore/Alumni Theology Interview project. In 2008, Dave joined the Malvern Prep Alumni Board and was instrumental in the success of countless Alumni initiatives and fundraising efforts. In 2012, Dave began his three-year term as the President of the Malvern Prep Alumni Association and from the start proved to be a transformational leader. Through his guidance, the number of alumni serving on the board of trustees increased significantly. Dave focused on ensuring that the alumni “voice” would be heard at the highest levels of school leadership. Dave has been involved in numerous school initiatives such as the Strategic Plan Committee in 2011, and the capital campaign cabinet formed in 2014. Dave has also served on the Alumni Golf Outing Committee, and in 2015 he served as co-chair of the committee. Dave and his wife, Michelle, currently reside in West Chester, Pa., with their three children, Tyler, Madison and Jake. Dave’s years as a student were filled with many accomplishments in both athletics and in the classroom. As early as his sophomore year, Dave was named All-Inter Ac for track and field, a feat that he would also accomplish as a junior and a senior. Dave earned six Team MVP awards for the indoor and outdoor track teams and at the time he graduated had set school records in the 200 meter, 300 yard, 400 meter and 600 meter dashes, and the 4 x 220 yard, 4 x 400 meter and 4 x 440 relays. Dave was also a member of the Penn Relay Championship teams for the 4 x 400 in 1994 and 1995. On the gridiron, Dave also accomplished success early on as a starting defensive back on the varsity team as a sophomore. During his junior and senior seasons, Dave was a two way starter for the football team as a wide receiver and defensive back and would garner All-Inter Ac honors his senior year.Dave and his wife, Abigail, currently reside in Exton, Pa., with their two sons, David, Jr. and Mason. As an athlete, Frank was a rare three-sport star and established himself as a contributor to his teams as early as freshman year when he earned a varsity letter for the baseball team. By Frank’s sophomore year he was also earning varsity letters in football and basketball. As a junior, Frank was named Second-Team All-Inter-Ac in football, basketball and baseball. During Frank’s senior year, the accomplishments continued and he was names First-Team All-Inter-Ac in all three sports. In football, Frank was also named First-Team All-Chester County, First-Team All-Suburban, First-Team All-Main Line and Second-Team All-City. Frank led the team in receptions (37), receiving yards (599) and interceptions (5) in his senior year. On the court, Frank was named team captain for his senior year and earned First-Team All-Chester County, First-Team All-Suburban, and First-Team All-Main Line honors. His senior year success continued on the baseball field where he was also named captain and was selected First-Team All -Chester County and First-Team All Main Line. Frank and his wife, Jennifer, currently reside in Kimberton, Pa., with their three boys, Francis, Charles and William. During his time as a student, Kevin established himself as one of the most diverse athletes to ever come through the School. As a sophomore, Kevin earned his first varsity letter on the football team and would go on to earn eight varsity letters overall. As a senior, Kevin would have the honorable distinction of being a three-sport captain for football, basketball and lacrosse. As the Co-MVP of the football team his senior year, the Friars won the Inter-Ac title and individually Kevin was named First-Team All-Inter Ac, First-Team All-Suburban, Second-Team All-City, and Second-Team All-County. On the court, Kevin was a two-year starter for Coach Bud Tosti and was a Markward Club Award Winner. Kevin was also a two-year starter on the lacrosse team and was selected to the Honorable Mention All-Inter-Ac team. Beyond his distinguished accomplishments, Kevin also received the Team Sportsmanship Award for both football and lacrosse in his senior year. After his playing days, Kevin was a varsity assistant coach for 15 years for the Friars football team and would eventually be named Head Coach of the program. In five years as head coach, Kevin compiled a record of 37-17 and won three Inter-Ac titles. 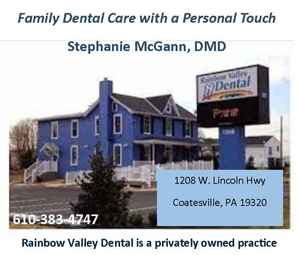 Kevin and his wife, Kaitlin, currently reside in Downingtown, Pa., with their three sons, Blaise, Dylan and Quinn, and their baby daughter, Shea. In his four years on Warren Avenue, Jim would become one of the School’s most decorated and accomplished basketball players, while also contributing as a three-year varsity letter winner on the baseball team and a starter on the 1988 Inter-Ac championship team. On the court, Jim would have a storied career. As a junior, he was selected to the Second-Team All-Inter-Ac and would go on to be named First-Team All-Inter-Ac as a senior. Jim was also named Inter-Ac MVP and Third-Team All-City in 1989. Local High school sportswriter Ted Silary named Jim as one of the Top Five Malvern Prep basketball players of all time. Jim would later serve as the head basketball coach for seven seasons at Malvern Prep, where he also enjoyed unrivaled success in winning two consecutive Inter-Ac titles for the first time in 40 years and ended the 2012 season as the second-ranked team in Philadelphia. Jim is currently the head men’s basketball coach at Neumann University. Jim and his wife, Maureen, currently reside in West Deptford, N.J., with their two daughters, Molly and Megan.